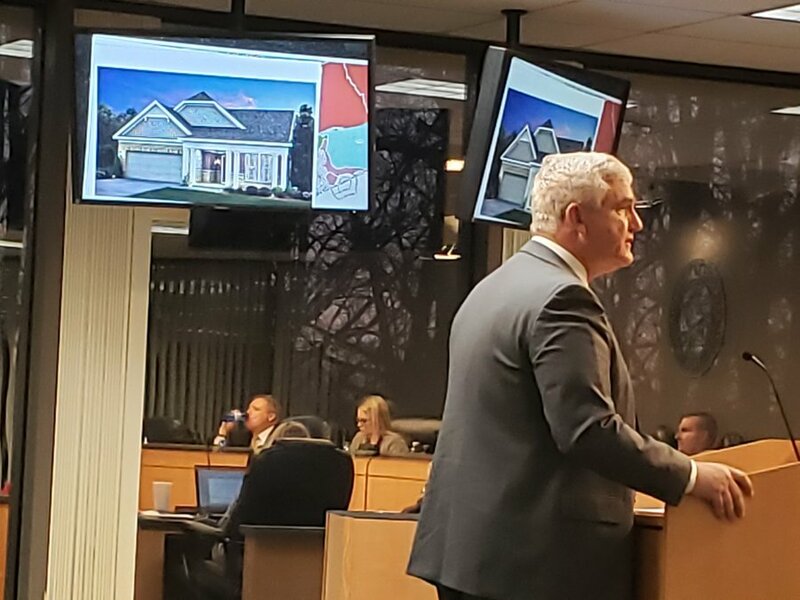 Brian Rochester of Gainesville engineering firm Rochester & Associates talks to the Hall County Board of Commissioners on Wednesday, Feb. 13, about a proposed 151-lot subdivision near Braselton in South Hall. Updated: Feb. 13, 2019, 9:54 p.m. The Hall County Board of Commissioners approved a 151-lot subdivision off Union Church Road near Braselton in South Hall on Wednesday, Feb. 13. Residents had opposed the development, expressing environmental concerns. “Our concern is that as building increases and more development increases along the river … that we’re going to see additional erosion and more issues with the river,” resident Scott Wargo told the commission. Wargo also said he was concerned about the development’s density. Brian Rochester of Rochester & Associates, representing applicant Pulte Homes, said he believed the subdivision had a “reasonable density” when compared to neighboring properties. Originally, Pulte was seeking 195 lots, or 3.3 units per acre, but that number was trimmed down as part of the planning board’s recommendation. The Board of Commissioners ended up rezoning the 60 acres from agricultural-residential to planned residential development. Plans for the subdivision call for an amenity area with a dog park, gathering area with pavilion or gazebo, parking area and mailbox kiosk. The amenity area may also include walking trails, passive pocket parks and a fire pit, according to Pulte’s application. “Existing structures located on the property will be removed prior to the development of the property,” the application states. The property now has several single-family residences, a single-wide mobile home and various outbuildings, according to a Hall County staff report on the proposal. Rochester also said the development would be targeted to people 55 and older.